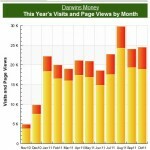 August was another great month for Darwin’s Money and my other web properties, as well as the outsourcing biz and real estate deal covered in more detail below. Traffic hit an all-time high this month on some “seeds” I’d planted a while back that sprouted. 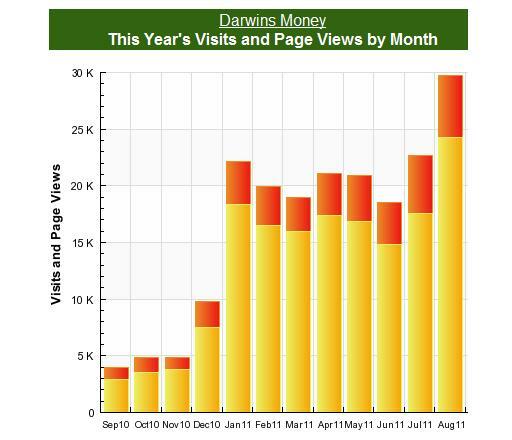 It was a 31% increase from last month to about 30,000 views. See, for a while I was ranked #1 in Google for “AAA Rated Companies” and was getting only a thousand or so visits a month, but when S&P downgraded the US, there were thousands of searches a day for related terms. 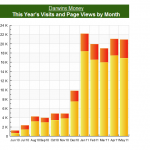 I had a few other similar older articles that sprouted and well as some nice referral traffic from the following top 3 blogs referring visitors: TheBurningPlatform, Oblivious Investor and LenPenzo (all very awesome bloggers you should check out!). For this site, that’s about a 17% increase in earnings over last month. I’m very excited about the deal set to close later this month where a partner and I will be buying 5 properties on a college campus. 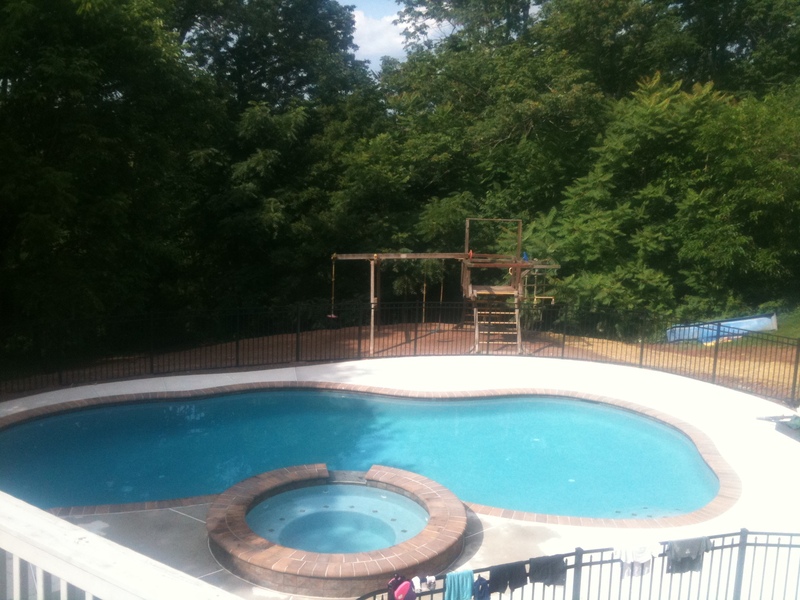 The cash flow is great and we have a very good property manager lined up to handle the students, repairs and such. It’s been a fair amount of up-front due diligence and expenses all lined out in my real estate deal post and I’m borrowing $50,000 from my 401(k) to close the deal, but I anticipate it will be well worth it a few years down the road. I’ve been profiling the CAD-Sourcing biz and old college buddy and I started up. It’s going quite well, we turned a profit last month after just a few short months in business and we have some steady customers which gives some visibility into future profits and allows us to expand further without the same fear of hemorrhaging money had we started out big right from the start. We have a new partner who’s very invested in the company and has some great PPC experience from a prior business, so between my SEO and his PPC, we’re seeing improved traffic and conversions at the site per given ad dollar. 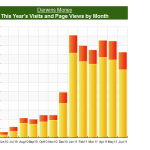 The beauty of business on the web is scalability. As we refine our metrics further and pick up another large customer or two, we can just continue scaling this business out until we either a) run out of CAD Drafters or b) make too much money:>. I don’t see either of those happening any time soon; it’s real exciting. Things were a bit crazy in our personal lives but ended the month nicely. My two youngest kids got coxsackie flu and then our oldest ended up being hospitalized with viral meningitis during the month of August. Everyone’s OK now and we just wrapped up a vacation in Ocean City NJ following the hurricane where we lost 2 days of our vacation, but had a great time nonetheless. Now, we’re about to have a “back to school pool party” and have some of my kids’ buddies over for a swim. Things at work are crazy as usual; I just logged in after a week off and saw all kinds of issues that need to be resolved quickly, but of course it’s a 3 day weekend and nobody will be around (at least in the US) until Tuesday so I can spend some time tomorrow getting ahead of those issues. Things are good and busy in my group; not so worried about a layoff myself even though the company continues to shrink, as are most biotechs and pharmas over the past few years. No crazy headhunter considerations or promotions of late, I can see myself staying put for a while, especially since we better not be moving after putting in that pool! For the next month, I have a bunch of great post ideas that I have to get turned into actual readable content, we have to close a real estate deal, expand our CAD business further, and I’ve had a few domains registered for some time that I’ve been meaning to kick off but haven’t yet found the time – maybe I will this month! Anyway, as always, life is good. If you enjoy these updates or want to learn more about how I make money blogging and my side business updates, make sure to subscribe via RSS or Email for free! Nice income numbers! Congrats on the growth and the Plutus nominations. Sorry to hear about the kids being sick but it sounds like all is better now and you had fun on vacation. Thanks; I love putting up numbers like that, it will be a challenge to duplicate again this month! wow, that’s quite impressive. You’re an inspiration for new bloggers! Thanks for posting and keep up the great success. Thanks, glad I could provide some inspiration! That’s humbling. Wow you had a great month! Looks like you’re doing well diversifying your income streams and creating new ones. Glad the family made it out ok.
Yeah, I like the diversification part, just not so sure about the “duplication” part month after month. I wish it were more steady, I always feel like it’s going to go away! I remember when you first started talking about the CAD business. It’s nice to see it go from concept to profitable businesses. Any plans for more businesses? Oh yes, we have tons of plans. Near-term, a bigger office, hiring more staff, blowing out the Adwords budget to scale up our work and then using excess staff to help more w the site and link-building. It’s becoming quite the enterprise! Nice numbers.. 31% increase in one month is sweet! We saw something similar to your AAA ranking, but it had to do with the new $100 bill and how the US screwed it up. It was all over the news a few time this year and we ranked well for it at the time.